Campbell’s Soup, the world’s largest soup manufacturer, challenged CrossRoads Studios to add new spice and expandability to its Soup & Recipe Mix line. CrossRoads Studios developed this bold packaging to break through supermarket clutter, while building on Campbell’s heritage. 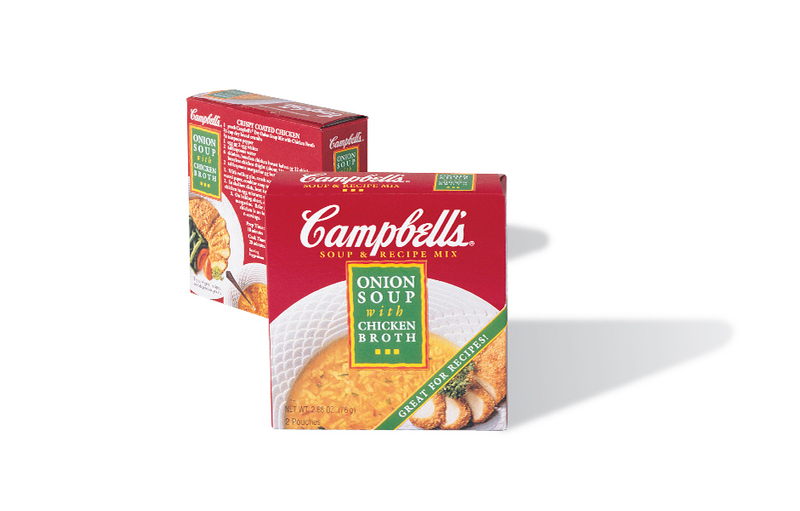 The flavor color coding tastefully identifies the type of soup and allows Campbell’s to easily broaden the product line. Since the launch of Onion Soup with Chicken Broth, the line has been expanded to include Chicken Noodle, Creamy Chicken, Double Noodle, Vegetable and Regular Onion. Do you have a new product to develop? Do you need a brand refresh or brand extension? CrossRoads Studios has extensive global packaging experience in numerous industry categories. CLIENT NOTES: Campbell Soup Company, also referred to as Campbell’s, is located in Camden, NJ. Its products are sold in more than 120 countries with more than $8 billion in annual sales. It manufactures food products such as soup, simple meals, dressings, snacks, packaged fresh foods and beverages. Its brands include Pepperidge Farm and Goldfish, Arnott’s, Kjeldsens and Royal Dansk, V8, Bolt House Farms, Garden Fresh Gourmet, Plum Organics, Swanson Broths, Prego and Pace.